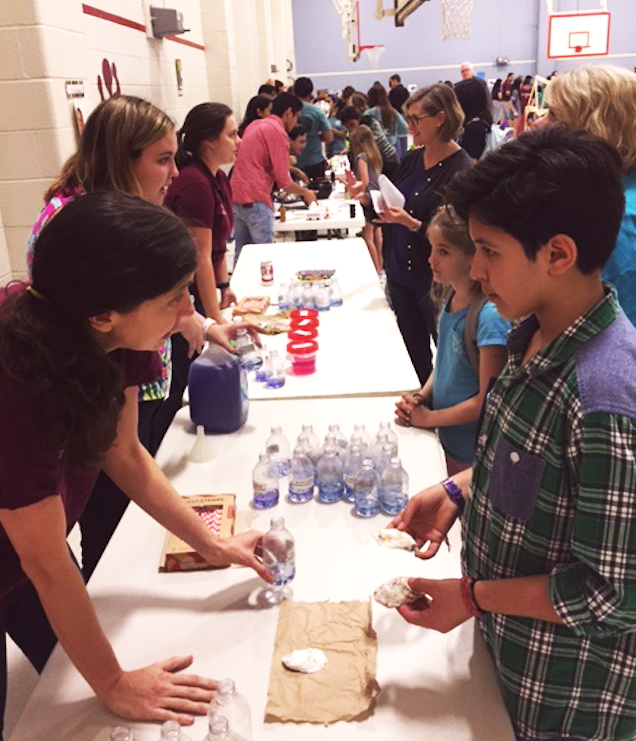 Graduate students from the Department of Oceanography at Texas A&M University traveled to Rock Prairie Elementary on Thursday, February 23rd for an Educational Outreach Event on ocean acidification. Students had a unique opportunity to participate in a hands-on activity illustrating the negative effects of additional CO2 in the oceans. “We conducted an ocean acidification experiment that visually shows them how carbon dioxide decreases the pH of the ocean, and subsequently harms marine organisms that form calcium carbonate. What is amazing is that even at such a young age, they seem to fully grasp the concept of OA, which can be a complicated topic.” said graduate student Andrea Kealoha when asked about the event. The activity included students blowing air (CO2) into a cup of cabbage juice that acted as a pH indicator. As more bubbles were blown into the juice, the acidity increased and changed the color of the juice, visually showing how the addition of atmospheric CO2 to the ocean affects the pH. Students further discussed how this change to the ocean potentially effect the marine organisms that live there and brainstormed what changes they could make in their daily lives to reduce their carbon footprint. Community outreach continues to be an important avenue for spreading awareness about different environmental issues and to encourage the next generation of scientist to consider a career in geoscience. The Department of Oceanography at Texas A&M University schedules multiple educational outreach events each semester and is always looking to add more opportunities. Please contact Dr. Chrissy Wiederwohl (chrissyw@tamu.edu) for more information on how to bring educational events to you!